The eighth edition of The Passion will take place on the 29th of March 2018, and it will be set against the backdrop of the Amsterdam area of the Bijlmer. The theme for this year will be based on a notion of ‘I see you’, and the wellknown musical translation of the story of the suffering and dying of Jesus will be part of a cultural programme designed to celebrate the 50th anniversary of the Bijlmer, which is in the capital’s borough of Amsterdam South-East. The idea of ‘I see you’ is about ‘being seen in a densely populated city’; where ‘people live next to but sometimes alongside each other’, and the Dutch TV broadcasters Evangelische Omroep (EO) and KRO-NCRV, who commission the event every year, have found the Bijlmer, known for being a vibrant multicultural and inspirational area, to be the perfect location for this year’s production. “This year we will focus our thoughts on the 50th anniversary of this special area of Amsterdam. The Passion is for us one of the highlights of this celebration. South-East is bustling and alive, and it is a breeding ground for talent and is in full development. We are proud to share this via The Passion with the Netherlands”, said District Chairman of Amsterdam South East Muriël Dalgliesh in a press release. Despite its reputation for its lack of infrastructure and job opportunities; as well as for the tragic 1992 airplane crash, which was reportedly the country’s largest aircraft disaster ever recorded, the Bijlmer has also enjoyed the status of a survivor against the odds, and the show’s broadcasters described the production in a press release as a ‘raw but comforting story against the background of a neighbourhood that is known for grief and adversity, but also with reconstruction and resilience’. “The fact that we can share the experience of this centuries’ old Easter story in the Bijlmer can be called nothing short of a highlight. Never before have we told the story of The Passion from a place with such a mixed population: The Bijlmer, where no less than 130 nationalities live together”, KRO-NCRV Director Yvonne de Haan was quoted in a press release, adding that this year´s Passion stands for diversity and connection. To celebrate the area’s semi-centennial, a variety of local organisations engaged in media, events, art and education have joined forces to create a full programme with performances in theatre, art, education and sport, which started on 25 November 2017 and will run until 25 November 2018. The aim of the annual evangelical musical spectacle, which is recorded live and can be seen live on TV as well as on the internet, is to allow audiences, whether religious or not, to get to know the story, which has been put forward in an accessible and contemporary way. Its inspiration came from The UK where in 2006 a local performance was recorded live by the BBC in Manchester. 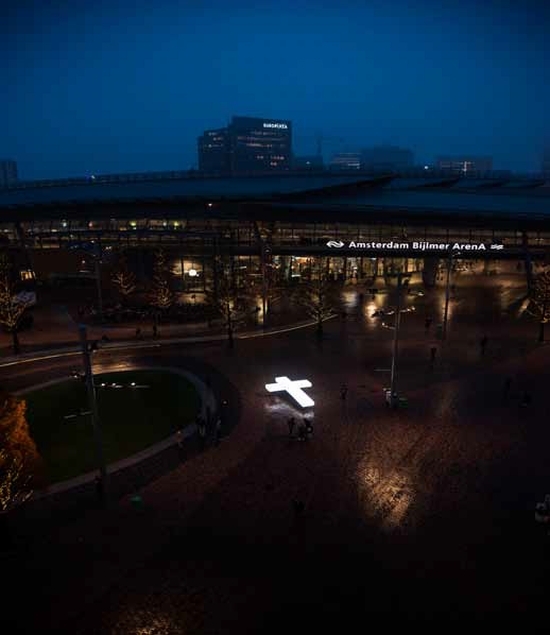 According to Amsterdam news channel AT5, this year there will be a large procession and a white cross through the streets of the Bijlmer, to end on a large podium where the play will take place. The passion is a cooperation of the Dutch Protestant Church, the Salvation Army and Amsterdam South-East. The production is made by Eye2Eye Media for Dutch channels EO and KRO-NCRV. The event can be seen from 8:30 PM European time on NPO1 and is scheduled to finish at around 10:00 PM. It can also be followed live via the internet, Twitter and Facebook.